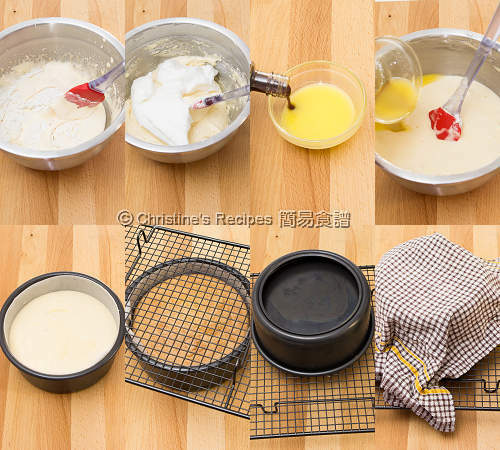 There are two ways of making sponge cakes. One way is to use whole eggs, the other uses separated eggs. I found the latter method is easier to get the best and fluffy cake that Asian people most enjoy. All you need is only 5 ingredients. If vanilla extract is omitted, only 4 ingredients can do then. By icing this sponge cake and decorating it with strawberries, it turned into my husband’s birthday cake. This recipe finally got posted. Hope you’ll love it. Top right: Egg yolks and sugar are beaten until turns pale and increases volume. Melt the butter in a microwave oven or double boiler. Mix in the vanilla extract. Set aside. Carefully separate egg yolks and egg whites. Divide the sugar into 2 equal portions. With an electric mixer, beat the egg yolks with 30 grams of sugar on high speed, until turns pale and increases volume. 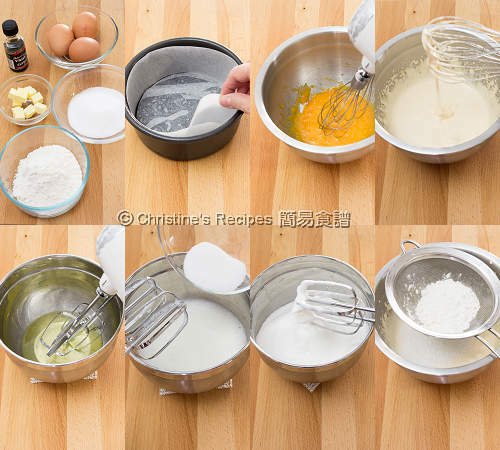 If you lift up the whisk, the batter dripping down should be able to draw distinctive lines on the surface. Set aside. In a large clean mixing bowl without any trace of water or oil, beat the egg whites with an electric mixer on medium speed until foams formed. Beat in the remaining 30 grams of sugar in 3 batches. Increase speed to high. Continue to beat until stiff peaks formed. Lightly fold-in 1/3 of the beaten egg whites into the egg yolk mixture. Sift in half of the cake flour. Repeat this step to fold-in the remaining beaten egg whites and cake flour. Lightly stir in the melted butter and vanilla extract into the batter. Scrape from the bottom and fold onto the surface. Don’t stir too hard though because you don’t want to knock out the air in the batter. Just combine all the ingredients. Pour the batter into the lined cake mould. Bake in the preheated oven for about 30 minutes. Test the cake with a needle that comes out clean. Invert the cake onto a wire rack. Cover with a damp towel to prevent it from drying. Remove the cake from the mould after it completely cools down. Cover and let it rest for a night. The cake is ready to be decorated with icing to your liking. Here’s the recipe of strawberry cream cake that I made for my husband’s birthday. When combining the beaten egg whites into the egg yolk mixture, try not to over mix and move quickly. Otherwise, the air inside will be knocked out or the cake will turn tough. The damp cloth that covers the inverted cake mould is to help keep moist inside the cake. 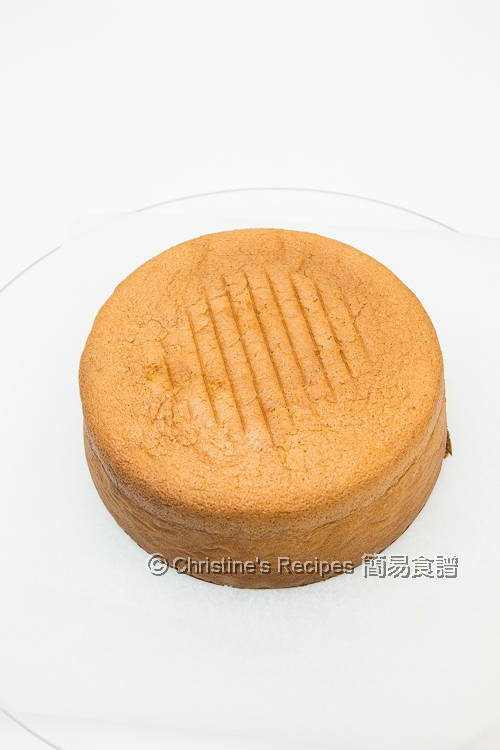 If a 20-cm/8-inch cake mould is used, the ingredients are increased as follows, same method as above. I noticed you inserted baking sheet around the cake tin and bottom too. If you invert the cake after baking, won't the cake fall out easily? Then what's is the point of inverting the cake? Hi I do not see water in your ingredient list. For beating the egg white to stiff peaks in step 5, I think you meant sugar in 3 batches for the remaining 30g you have left? And not water to beat egg white I suppose. You're right. No water is required to make this sponge cake. The cake will be brushed with rum syrup and decorated with icing. So it won't be dry and just right. Yes, beat in the remaining 30 grams of sugar into the egg whites in 3 batches. Don't ever add any water into the egg whites. 2. For a 9-inch cake, do you think double the recipe is good enough? 3. If I make this in green tea flavor, how many tablespoon of matcha powder that should be added for a 9-inch cake? Thank you! I have been following your recipes all the time and always success, so I hope to hear from you soon. 1) This sponge is soft but enough to hold mousse layers too. Good idea of using mousse instead of fresh cream for easy transportation. 2) For making a 9-inch cake, you can double all the ingredients. 3) Try 1 tablespoon of matcha powder as the start. Depending on how intense the matcha flavour you like, you might increase or decrease a bit to experiment. in point 5, you mentioned to put the 30 gm of water. water or remaining sugar ? I was wondering if it is possible to leave out the baking sheet (liner). The liner is to help remove the cake easily. If you want to leave it out, hope you'll find a way to remove the cake easily. I know the measurements for the pan are 6" round or 8" round. But how tall should the pans be? Thank you! The height of both of my 6-inch and 8-inch round pans are 3 inches. Hi Christine, is it possible to use plain flour for this cake recipe ? Sure, you can use plain flour instead if you don't mind the end-product texture different form mine. Is it possible to post the recipe in cups please? When it comes to baking, weight measurement is more accurate and enables you to produce the best results. So I didn't have any cup measurement records. Sorry. You might search the conversion on the internet. Hi Christine, can we substitute the caster sugar with regular sugar or icing sugar? We have a family member that seems to get an allergic reaction each time we use caster sugar in cooking. Thanks! Caster sugar is finer than regular sugar and can be dissolved more easily and quickly while beating. You might use regular sugar though. Make sure that you beat until the sugar is dissolved completely. I have tried this recipe twice, came out real nice! Thanks!! I have one question, my cake seems to have yellow spots here and there, and I am not sure why... what should I do to get even color? Probably the yolks weren't mixed well, leaving yellow spots in the batter. If the eggs were chilled before, it's hard to break them down. Next time try leaving the yolks at room temperature for a while. Then beat the yolks first, then add the sugar. See how it goes. How can I adjust this recipe to make a chocolate/coffee sponge cake? You might add one or two tablespoons of cocoa powder or coffee powder. Hi Christine, my cake did not rise, not soft, not fluffy. I read all the comments and the recipes seems to work for everyone. I wonder where I mess up. I weighed the ingredients, followed each step, the cake batter loked exactly like yours in the video, using 8 inch round pan, baked 350 degrees 30 minutes. If your measurement was right, followed all the steps exactly right and the batter looked exactly like mine, I really don't know what went wrong with your cake. I wasn't with you while you made this cake. So anything that I say will just be guesses. I tried making the Hokkaido Milk Bread last weekend and it was a success! First time I got a good recipe from internet :) My kids loves the bread so much that I am going to bake it this week again. This time, I am going to try this sponge cake receipe! Hope you also get big success on making this sponge cake. 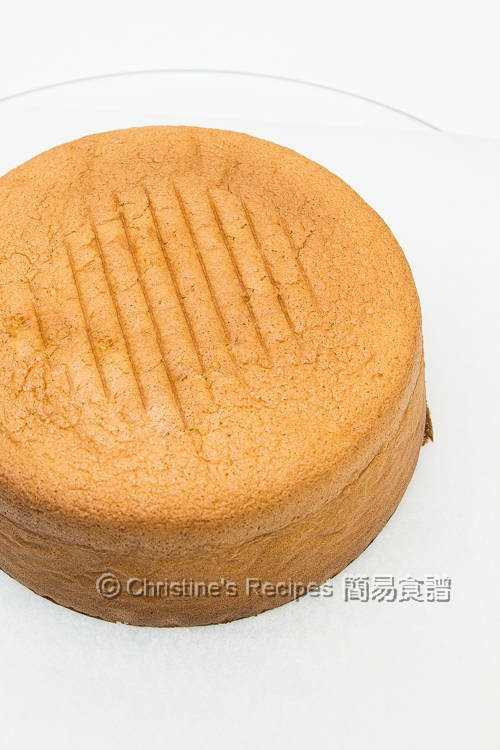 I live in rural China, and a local friend of mine has been telling me for weeks that she wanted to try to make a sponge cake. It's hard to find certain ingredients and equipment in this small town, but I recently found an electric mixer on Taobao, and brought back some vanilla from a recent trip to England. Anyway, today my friend came over, and I googled "sponge cake recipe"and found your page. I suggested that we watch your video first, and said apologetically, "it will be in English, but at least you can see how it's done". "(My friend doesn't speak English). Imagine our surprise when we realized the video was in both Chinese and English! So we made the cake, substituting vegetable oil for butter (butter isn't available in our small town, I have to buy it at the nearest large city, and it's very expensive). It was a great success! My friend and her seven-year-old son loved it! I'm sure we'll be visiting this page again. Glad that my recipe and video helped you and your friend. Congrats on your success at your first attempt. I feel happy for you too! Hi Christine, I use your sponge cake recipe for 8 inch cake, but my cake tin is 8.5inch. I reduce the sugar to 70g instead of 100g. The cake quite solid, not soft & fluffy. The height is only about 2 inch. The egg white was beaten nicely, hard enough. May I know where gone wrong please? Do the sugar matters? Thanks. Thanks for the recipe which I like to try.In your recipe, what is the size or weight of the egg. I live in Canberra Australia too. The egg I used weights 58 grams each. I often buy a box, 12 eggs, 700 grams. Can these be made into cupcakes or will the sponge shrink like chiffon after taking out of the oven? Hi, this cake is quite light, but won't shrink like chiffon, if the egg whites are beaten properly. hey, can i use baking powder in this recipe? last time i used a recipe that called for no baking powder turned out to be a disaster for me :( so does this one really work fine without it? When it comes to making this cake, it's all about beating and folding egg whites. If you get the hang of both skills, you don't need to add any baking powder. I've got some tutorial videos posted on Youtube showing how to beat and fold-in egg whites. It'll help. Or else, you can add a little bit of baking powder if you're still not sure. It helps to hold the cake in shape.